This beetroot juice is super simple to make. You don’t even need a juicer. Just load everything into a power blender and blitz. The flavours of beetroot, orange and ginger meld well together with complimentary notes of earth, sweet, sour and spice. I add a little water to help the mixture blend and to make the drink less intense. The juice is perfectly acceptable just as it is, but if you prefer something a little finer, pass it through a sieve. I did both. I generally prefer my juices to have all the bits in; dietary fibre is not only good for you, but it slows sugar absorption into the blood stream. However, in this instance, I felt the sugars weren’t too excessive and it would be nice to try a more clarified version. Beetroot (Beta vulgaris) is one of the few veg I’ve been able to grow since the deer started getting onto our plot a few years ago. Beetroot are obviously not to the deer’s taste. I don’t know if I’ll manage to sow any seeds this year as we still have so much clearing to do in our new garden, but I’m hopeful. We’ve grown all sorts in the past: golden, stripy and white, but good old-fashioned purple is my favourite. It’s a nutritional powerhouse loaded with vitamins, minerals and antioxidants. 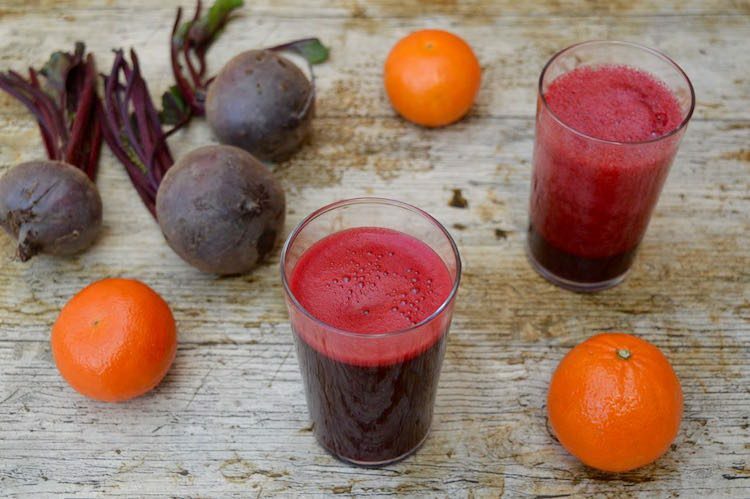 I wanted to use blood oranges for this beetroot juice with orange and ginger. The blood colour of the oranges just seemed like a good fit. Sadly, I’ve been unable to find any this year, so I used a common orange orange instead. Oranges not only add sweetness and essential sharp notes, but they’re also chock full of Vitamin C. It is this vitamin, in particular, which is most likely to be lost through oxidation; using a vacuum blender makes a big difference to the nutrient quality of blended drinks. See below for more details. Beetroot is a firm favourite with me, but CT is less keen. Ginger (Zingiber officinale) gives this very earthy vegetable a bit of kick and sends it to a more fiery place. We’re both big fans of hot and fragrant ginger. It’s good for so many things: headaches, nausea and arthritis to name but a few. I made the juice in my new Optimum Vac2 Air Vacuum Power Blender. This incredible machine not only blends everything into a smooth and silky liquid, but if you use the vacuum function, you get more vitamins and minerals for your buck. Yes really. By taking the air out of the ingredients, less oxidation occurs leaving your juice or smoothie staying fresher for longer. I’ve been really impressed at how long my smoothies last without discolouring since I started using the Vac2. I make a big batch now to last for three days. Not only are more of the nutrients retained, but my smoothies have not separated to anything like the extent they used to. Often they don’t separate at all. If you’re interested, you can read all about it in my Optimum Vac2 review. For other recipes using this fab machine take a look at my Full on Froothie page. I can also offer you an extra discount of £20 from this or any other Froothie Blender. Use the code AMB20 when you order through my link. No need for a juicer, you can make this simple juice in a good blender. Containing only three ingredients, it's tasty and full of nutrients. Just load everything into a power blender and blitz. I used the vacuum and smoothie functions of my Optimum Vac2. If you're feeling in need of an extra boost, add ¼ of the orange peel and pith prior to blending. Drink as is, or pass the mixture through a sieve for a more juice like result. Will keep in the fridge for a couple of days, more if made in an air vacuum blender. I’m linking this beetroot juice with orange and ginger to #CookBlogShare hosted this week over at Everyday Healthy Recipes. Thanks for visiting Tin and Thyme. If you make this beetroot juice with orange and ginger, I’d love to hear about it in the comments below or via social media. Do share a photo on social media too and use the hashtag #tinandthyme, so I can spot it. For more delicious and nutritious recipes, follow me on Twitter, Facebook, Instagram or Pinterest. 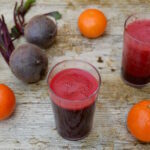 Beetroot Juice with Orange and Ginger. PIN IT. Thanks Iris. It’s a good one. I always feel I’ve had a good boost when I’ve had some beetroot. I love juices and smoothies with ginger in them so this would be perfect for me. I can imagine that those flavours go perfectly together and definitely need to try beetroot in a smoothie now. Ginger is such a fabulous spice and lifts pretty much anything. What a great flavour for a juice. This combination is actuallylly one of my faves as a soup so I now need to try your juice to see how it tastes chilled! great flavour combo with orange and beetroot, and interesting about the new blender! Would love to find out more about the research and testing of the extra nutrients! Wonderful colours and flavours in this and I can imagine that it has a real zing about it. What a great combination of flavours Choclette. I think I’d enjoy this one. What a beautiful colour juice. I love orange and ginger together, and I bet the beetroot adds so much flavour too. Such a great way to enjoy a nice glass of color and health! Ha! Hello Choclette, this recipe looks very yummy! Cannot wait to make at home! Glad you like the look of it. It’s a good one.